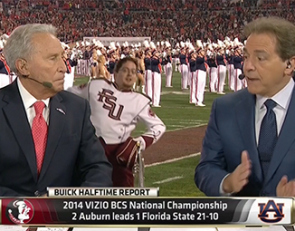 Shirts With Random Triangles: Nick Saban celebrates Lee Corso's 80th birthday by donning Big Al's mascot head. Just when you think you have Saban pegged, he does something that surprises you like this. Of course part of Saban's reason for the act may come from this YouTube clip, where Corso explains that Auburn refuses to let Corso don Aubie's head for his weekly game pics, the only college to do so. The only thing missing is Kirk Herbstreit subtly disturbing fondness of fondling Big Al's trunk while Corso wears the 'Bama mascot's head.